For pancetta to be authentic pancetta, the pork must be cured, then dried. Curing is the easy part. It can be done in the refrigerator. No problem. Drying it, however, can get tricky. It needs to be hung with air circulating around it freely on all sides for two weeks, at cellar temperature. And the atmosphere can’t be too dry or too warm or cool. 58° is just about perfect. A wine refrigerator is just about perfect – cool and climate-controlled. But most people have them filled with wine. Silly, eh? 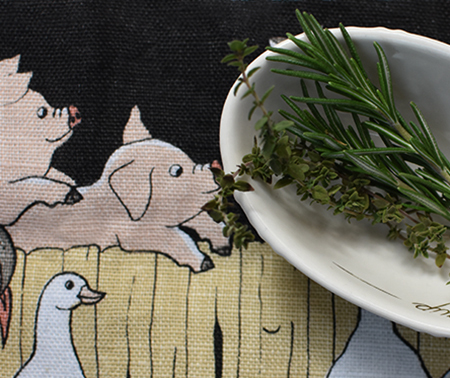 Don't you love this tea towel? A gift from Andrea The Kitchen Lioness! Lacking the perfect drying environment, I took the easy route. I cured the beast in the fridge, then sliced it into matchsticks, and froze them in 3-ounce portions. It is really good. The taste is much brighter and less salty, and less chemical tasting than commercial pancetta. The matchsticks may not be perfect if you need thin slices of pancetta to wrap a roast but, if you have a meat slicer, you might successfully accomplish this. If you want it in matchsticks or cubed, I’m your pig. A couple of notes. 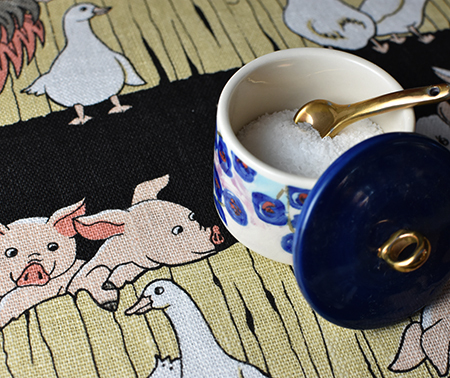 I bought the pink curing salt online. I found lots of sources, and learned that a small package will go a long way. The one I bought may last until I’m in my late 70s without any trouble, at which point I am sure my doctor will have forbidden pancetta. 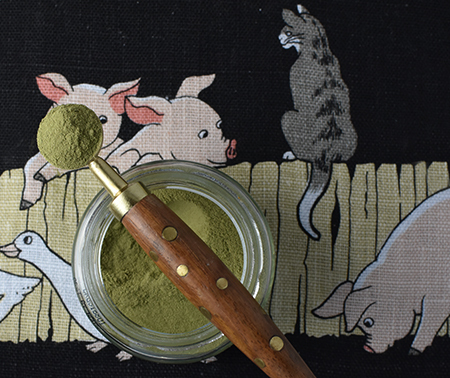 I used a combination of fresh and dried herbs, but you can use definitely use all dried or all fresh - just remember the golden ratio: 3 times as much fresh as dried. That’s about it. 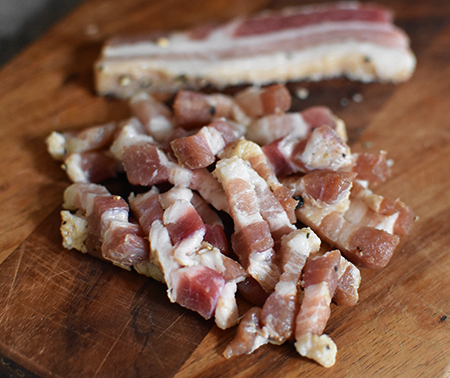 Easy homemade pancetta in just a week. Pancetta is wonderful for many purposes, but my favorite two Roman pasta dishes are why I make it: Spaghetti alla Carbonara, and Bucatini all'Amatriciana. I suppose I should post those recipes for you... stay tuned! 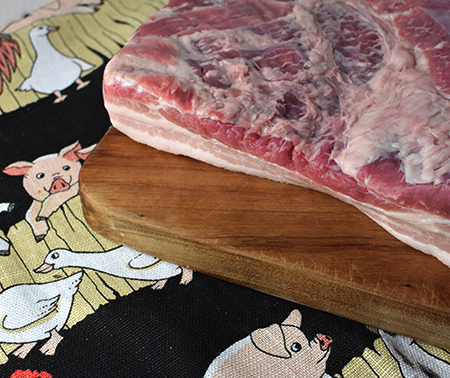 Trim the skin off pork belly if you wish. (I didn’t this time but will next time.) Wash the belly and dry it thoroughly. Place the belly in a gallon-sized sealable plastic bag. Place it in the refrigerator (I put it in the vegetable crisper drawer) and turn it every other day for a total of 8 days. After this, press your finger into the meat as you did the week before; it should now feel firm to your touch. If it is squishy, leave it in the fridge for another 2 days. When it is done, remove it from the bag and rinse it well. Dry it thoroughly with paper towels then place it skin-side down on a cutting board (I recommend a plastic board that can be run through the dishwasher). 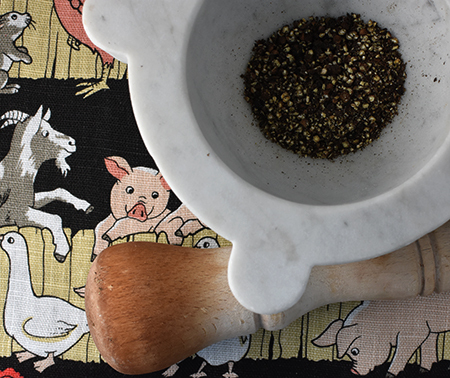 If you like, add another tablespoon of cracked black pepper on the meat side and press it in with your hands. At this point, I slice it into 1/4-inch slices, and then slice those into matchsticks. As it warms up, it will soften and become harder to slice. Putting it into the freezer for 5-10 minutes makes slicing easier. Divide into portions of convenient size for your style of cooking, and freeze. Thaw portions as needed. 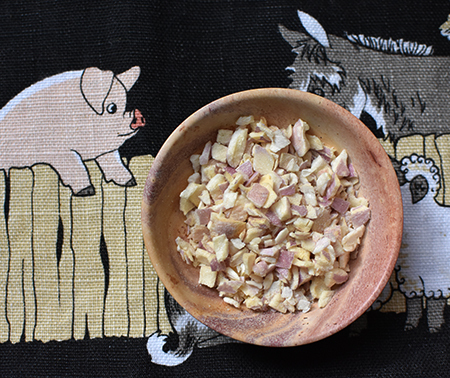 Note: pink curing salt #1, also know as Prague Powder, is a curing salt made of 6.25% sodium nitrite and table salt to use for short cures, like pancetta. Pink curing salt #2 combines sodium nitrate and sodium nitrite with table salt for longer cures - think hard salamis and sausages. The nitrate eventually turns into nitrite, lengthening the cure. Ah, one of my favorite things! 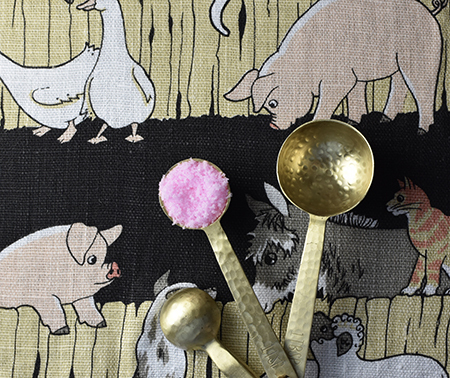 I LOVE everything PIG! :) I make pancetta often and always have some in my fridge. I don't use nitrate because no one in my family in Italy ever did. In fact, I don't buy anything with nitrates (unless it's from celery). Regardless, it's good to see homemade pancetta anytime! Enjoy it, David! Great effort, bet it tastes better when you make it yourself. This I absolutely have to try - your way since have forgotten what a below 35C temperature feels like even at 3am! And we are threatened with at least a week worse. Where there is a challenge there is a way!! Adore your sense of humour . . . poor, poor piggies . . .
Lucky for us, Eha, when it gets to 35C (or even 43C) here, we have air conditioning. I hope you take care - the heat can be very dangerous! Very impressive, David! I've been going through a lot of pancetta lately. A pity I couldn't buy it from you! John - I am sometimes surprised at how much pancetta we use. I think you will need to make some for yourselves! Must print this one for my mother. She is pork delicacies fan.... and I am grateful for every piece she makes since some of it finishes in my kitchen :-)Thank you David ! Wow - how lucky for you, D! What does she make? I am looking to try guanciale, too. Hi Stefano, I did skip air drying all together as I have no place for it. Simply cut into matchsticks and froze it. This reminds me of my childhood when my grandfather used to smoke his own ham from his pigs. The whole leg would hang in our pantry at the farm. My brother is known for his homemade salami. 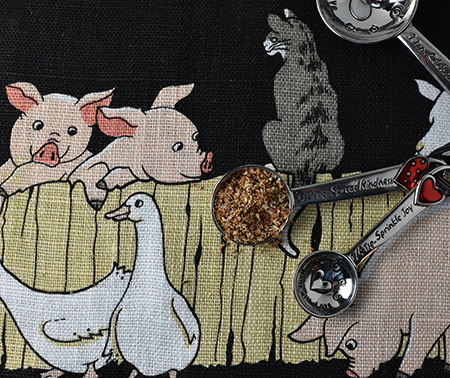 I love pancetta , especially in pasta and I love your cute photos. Thanks for sharing this recipe! I love that your family has a tradition of curing pig! Do you think you will try the pancetta, Gerlinde? I've been wanting to try this at home for a long while. This is now my inspiration. I don't think I've ever seen that pink salt before. 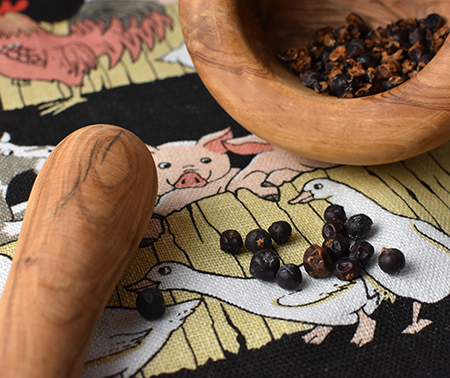 I love working with new things, and I absolutely love pancetta and use it in all sorts of recipes. I mean to add a note about the pink in the salt, Valentina. The color is added so that you don’t mistake it for regular salt and use it in day-to-day cooking. Basically, you just need to get curing salt #1, whether it is pink or not! Lovely cure John. I've not made my own pancetta but my son makes it and it's so much better than store bought. We get the Italian imported stuff here, but it's bloody expensive. So I'm thinking why not make some. Great idea to use a wine fridge as I know where one setting that is not in use (our basement). I can only imagine your pancetta in a dish of your Spaghetti alla Carbonara. Pure silky heaven. “Pure silky heaven” pretty much describes it, Ron! The Amaticiana we had the other night was spectacular! Really fun post! 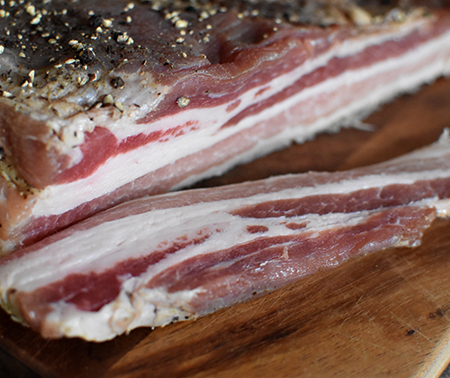 I can find really good locally cured piggy things, including pancetta, so I've never even thought of curing my own. And doubt if I ever will. Fun to read about, though! Thanks. Oh, John - I think you should! :) Thanks for reading and commenting! What a great idea and I bet so delicious. Amazing to be able to make your own and use the herbs and spices you like. Thanks, Caroline - I hope I am inspiring others (you?) to make their own, too. David, I've never made my own pancetta. I applaud you! Everything is better homemade, so I'm not surprised that this is too. This would transform a carbonara! Trust me, Jean - it does! My first curing was a duck breast - and I loved it. I think I called it duck prosciutto. Good luck - I hope it turns ot well! This is brilliant David. After making my own gravlax, prosciutto went right to the top of my list :). This would be a perfect intermediate step! Inger - I decided that pancetta was better than prosciutto, as I could never get prosciutto sliced as thinly as I would want! 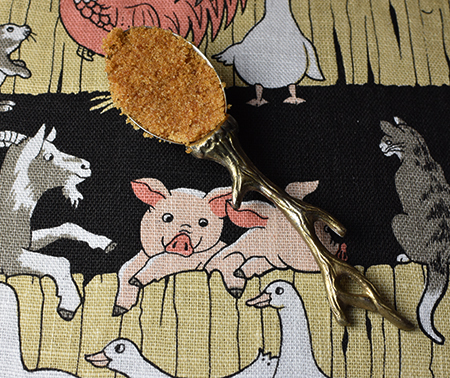 I did make duck prosciutto once, and it was really great. Well, you know me, Greg... thanks to my garlic issue, I have wanted to learn how to make everything! Even things that don't have garlic! Wow! This reminds me of the time, many decades ago, when I came home from the butcher with a big slab of corned beef. Wanted to be sure I cooked it right. Opened Joy of Cooking and found directions for submerging beef in brine for three weeks. You're a braver man than I, Mr. Cocoa. I corned beef only once just could never give up that much space in my fridge for that long a time again! It was good, though! The nice thing about pancetta is that it is flat and can hide easily in the fridge among everything else! My hubby would love this, he loves all the fancy european style cured meats.